Small Businesses and Non-Profit Organizations have a number of characteristics in common. They are usually on very tight budgets, have very few personnel and/or volunteers, all of whom wear many hats in the organization. They must depend on their ability to network within the community in order to reach their goals. While they share many challenges, these groups also can share many benefits from working together on projects. In this article we will explore how Maryland small businesses partnered with a local non-profit organization to introduce a new product into the marketplace. The power of community was reinforced as Maggie’s Light Foundation (the non-profit) partnered with small businesses Wilmot Modular Structures, and Spot-A-Pot and were supported with sponsorship from local banks like BlueRidge Bank and CFG Community Bank. Maggie’s Light Foundation is a non-profit organization that supports Maryland families, caring for their children and young adults with special needs. Their mission is to assist families in their efforts to create lives they and their children love! Lives filled with hope, friends, new experiences, and opportunities to engage and participate in their communities. Frequently when a new product is being brought to the marketplace one business is involved and takes sole ownership of the product. In this case many businesses joined together to cooperate in designing, building, and testing the EasyGoTM, a fully accessible family changing room. Since 1989 Wilmot Modular Structures has been an industry leader in the distribution, sales and leasing of portable, prefabricated, mobile offices, and custom modular buildings throughout Pennsylvania, New Jersey, Delaware, Maryland, Virginia and Washington DC. With vast experience in the design of modular buildings they had never created a self-contained handicapped portable restroom. Maggie’s Light had a wish list of specifications for a new fully accessible portable restroom. How much area is required for a wheelchair to maneuver, what are height considerations for the commode and the sink, how large a changing table is required and can it be raised and lowered to accommodate easy transfer for both children and adults. Wilmot Modular Structures took these specifications and working with their manufacturing partners funded, designed and constructed a prototype of the new product and named it theEasyGoTM. “From the day we started designing and then producing the EasyGo™, we all knew this was something special,” explains Kathy Wilmot, VP of Wilmot Modular Structures. Testing the new facility required an introduction to and promotion of the EasyGoTM at the event, supervision of the structure to insure its components were functioning properly, and market research – to insure that the facility was in fact meeting the needs of accessibility, all of which are staff intensive. Enter the next partner. The regional BlueRidge Bank seeks out numerous opportunities to provide support in their community. The Bank evaluated a sponsorship proposal brought to the bank by one of its officers who is also a Maggie’s Light Foundation volunteer. The proposal included a request for volunteers from the bank staff and funding to help support the launch of the EasyGoTM at an upcoming community event. When the bank evaluates proposals they consider the benefit that their support will have to the community and how their brand will be represented. Within in one week the bank had reviewed the proposal and agreed to partner with Maggie’s Light Foundation, Wilmot Modular Structures, and Spot-A-Pot at the community event. 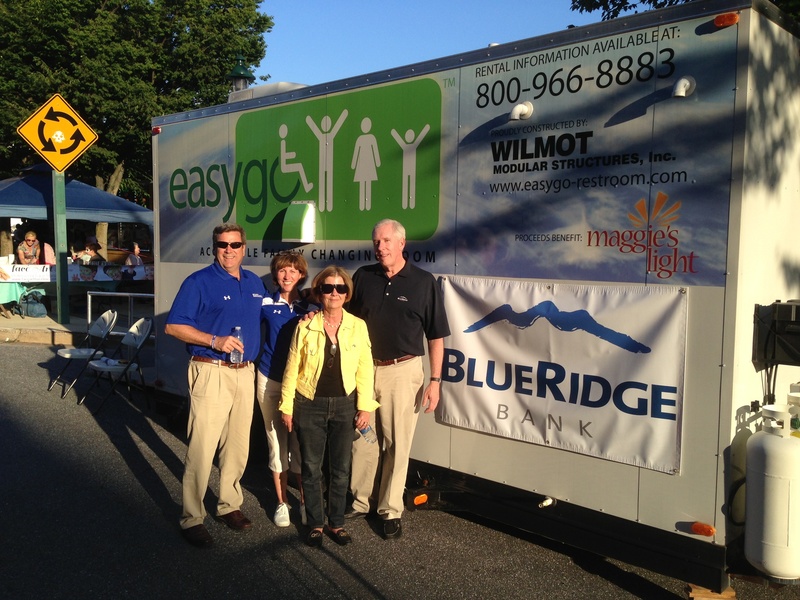 CFG Community Bank has a similar scenario and also stepped up to help fund the EasyGo™ at a local community fair. When Non-Profit Organizations and Small Businesses partner with each other – everyone wins. Maggie’s Light Foundation has found a REAL solution for allowing families to enjoy community events. Wilmot Modular Structures has added a new product to their Modular Structures repertoire. Spot-A-Pot has provided their expertise in the portable restroom business and now has another option to offer when bidding on large outdoor events. As a community bank The BlueRidge Bank feels their support of non-profits in their community is beneficial for the community and for the bank. Providing accessibility at public events means that ALL individuals can share in community activities. Marketing dollars for small and regional businesses, and, non-profit organizations are always stretched too thin. Being able to participate in a large community event is priceless. To promote the work of the non-profit, to promote the local businesses, and to be able to have public exposure that shows that your work is giving back to the community may not be quantifiable but it is quite tangible. The goal of Maggie’s Light Foundation is to be able to build more of the EasyGo™ restrooms so they can be set up at multiple venues. The ever present challenge is finding funds to build them and set them up at different events. If you or your organization has an interest in being part of their project and helping people with disabilities to get out into the community more, contact either Mary Anne Kane Breschi at Maryanne@maggieslight.org or Kathy Wilmot at Kathy@wilmotmodular.com.